Singapore’s biggest sporting and entertainment extravaganza promises guests a transformed hospitality experience with its most extensive makeover to date. 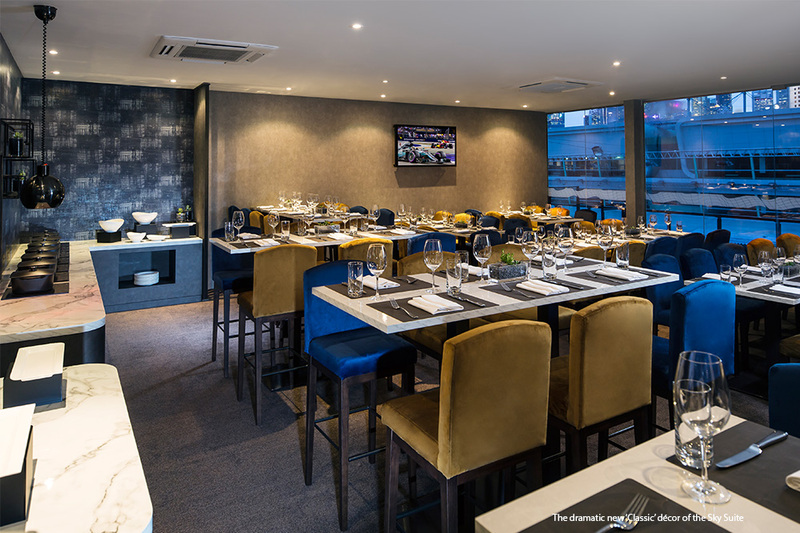 Race promoter Singapore GP Pte Ltd today unveiled two new hospitality experiences for the FORMULA 1 2018 SINGAPORE AIRLINES SINGAPORE GRAND PRIX. Guests will discover a whole new level of luxurious comfort at the fully transformed Sky Suite and a brand new hospitality product, Twenty3 while following the thrilling on-track action at the Marina Bay Street Circuit. Over the past decade, Singapore GP has made its mark with one of the season’s most dramatic races, a stellar entertainment line-up, and set the benchmark for unparalleled corporate hospitality. Building on this success and incorporating invaluable feedback from clients, the entire hospitality experience has been completely redesigned to cater to different tastes and needs. As a result, there are now five distinct hospitality offerings at the Marina Bay Street Circuit – the Formula One Paddock Club, Sky Suites, The Green Room, Lounge @ Turn 3 and the newly launched Twenty3. “Our offerings over the last ten years set the bar for exceptional hospitality, but as we embark on a new term with Formula 1, we have to continue to innovate, redefine and improve the hospitality experience for our guests. With the revamped Sky Suite and the introduction of Twenty3, each of our five hospitality options now offer a truly unique race experience that brings guests even closer to the race action,” said Shamini Suppiah, Director of Corporate Sales at Singapore GP Pte Ltd.
Central to to the comprehensive revamp is the Sky Suite, which now boasts 15 innovative features including a higher ceiling, improved ambient lighting, bold new aesthetics with luxe finishes, private balconies with unobstructed views, and enhanced common areas. Two décor options are now available for selection: Classic, which features splashes of vibrant hues against a dramatic backdrop, or Alternative for warm, earthy tones. Clients now also have the option to customise the food and beverage menu for the race weekend. With spectacular views of the race track, Singapore skyline and a myriad of alfresco dining options, guests can enjoy more sensational gastronomic offerings from award-winning restaurants and delight in specially concocted cocktails at the rooftop Sky Terrace. Guests can also experience a refreshing cutting-edge hospitality concept at Singapore GP's latest exciting offering. Twenty3 is the only hospitality option available as single day tickets, priced from S$955 for access on Friday, 14 September. Twenty3 promises a feast for the senses with multiple dining options, live music and bespoke entertainment areas to elevate the electrifying ambience at the Circuit Park. Housed within a massive 3,000 sqm facility, Twenty3 features a multitude of award-winning food and beverage options with support from St. Regis Singapore. Guests can choose to dine at any of the three feature restaurants for Italian, Asian or New Age cuisine, before unwinding at one of four speciality bars. Included in this year’s star-studded culinary offerings are household names in the gastronomic world. Franceschetta 58 – sister restaurant of Massimo Bottura’s three-Michelin-starred Osteria Francescana – will serve their signature Italian-influenced cuisine. Look forward to savouring the Modena eatery’s famous Emilia Burger, southern inspired pasta dish Mezze Maniche With Chickory, Anchovies Cream and Spicy Toasted Breadcrumbs, as well as a Venetian salt cod dish Baccalà Mantecato With Eggplant Purèe, Toasted Pistachios, Lemon Skin and Smoked Tea. Adding to the stellar gastronomic line-up is Le Charlemagne by the highly acclaimed chef Laurent Peugeot. Hailing from Burgundy, France, the hugely popular one-Michelin-starred establishment is known for marrying Asian and Burgundian cuisine to create exciting fusion flavours. On the menu will be Scallop Hokkaido with Takuan, Pomelo and Sake Yuzu, as well as Wagyu Beef Pot-Au-Feu with Daikon, Pickles and Ravioli. Guests with a taste for modern Chinese cuisine will be tantalised by the gastronomic offerings at the Five Light Pavilion (五灯亭Wǔ Dēng Tíng), a collaboration between local restaurant Blue Lotus Chinese Grill House and Albert Tse’s China Blue restaurant in Tokyo. Signature dishes include Green Lip Mussels with Garlic, Chinese Hua Tiao Wine and Crispy Mantou, Angus Beef Brisket Noodles with Citrus Spicy Clear Consommé as well as Roasted Australian Baby Lamb Short Ribs with Five Spices. For more casual options, head to the alfresco Makan Boulevard, where guests can feast on Indian Tandoori, grilled meats and Singaporean favourites such as Mee Siam, Satay and Laksa. Sweet treats will also feature at Twenty3, with esteemed Australian pastry chef Andrew Bowden’s Saga patisserie serving up its creations at the 10-metre long dessert bar. Saga is best known for its spectacular cakes and pastries by Bowden, who is better known by his online moniker Andy Bowdy. Guests can indulge in delightful treats like Glow in the Dark Vanilla Slice, and the chocolaty decadence of the “Karl” Cake. Those thirsty for tipples can head to one of Twenty3’s four bars that serve a variety of alcoholic drinks, such as champagne, wines and cocktails. Over at the Whisky Bar, guests will be spoilt for choice with 23 different kinds of scotch whiskies available straight, on the rocks, or as cocktails. Twenty3 also features the two-storey Apex Lounge where guest deejay Gil Glasenberg (DJ Gil Glaze) sets the tone for the weekend while guests can mingle over masterfully crafted cocktails from the feature bar. Adding to the ambience is a kinetic light installation specially brought in to Singapore from Germany for the very first time. Guests will be dazzled by the mesmerising movement and colours created by the 300 light spheres hanging overhead. Strategically located at the final corner of the street circuit, guests will be spoilt for choice with superb views of the Formula 1 cars as they go wheel-to-wheel towards the pit straight. They can choose to view the race from the full-length windows at the restaurants, outdoor viewing galleries, or join in the podium celebrations at the rooftop of the Apex Lounge and catch the dazzling fireworks display at the crowning of the champion. Bookings and enquiries for hospitality packages can be made via the hotline +65 6731 5900 or by email at hospitality@singaporegp.sg. For more information on the FORMULA 1 2018 SINGAPORE AIRLINES SINGAPORE GRAND PRIX, visit www.singaporegp.sg.